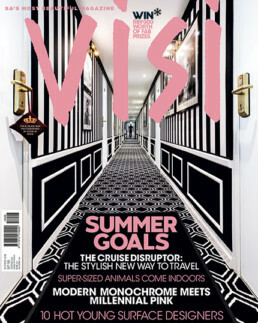 One of New Media Publishing’s flagship titles, VISI website and magazine is a celebration of all things decor, design and architecture. A combination of top-quality images, writing by some of the country’s best journalists and industry insiders, and creative layout design means that each and every issue of VISI is a collector’s edition: both beautiful to look at and filled with meaningful, engaging content. VISI, in association with Jaguar, went behind the scenes with a fashion designer, two artists and a restaurateur to discover how they are disrupting the norm in their industries. The first in a series of three videos showcases the work of renowned local fashion designer and furniture designer Rich Mnisi, who talks about how he uses visuals to enforce change and disrupt the way people think. Cape Town-based artist Lucie de Moyencourt shows VISI into her home in Gardens for a sneak peek at two of her favourite nooks. These Fancy Corners are the perfect places for relaxation and to indulge in cherished pastimes. Watch the full video above to get an inside look into Lucie de Moyencourt’s two Fancy Corners.